I believed every Malaysian and Singaporean should know this common rice dish, a coconut flavour rice served with spicy hot sambal chilli. It is commonly served as a breakfast item or currently, it was being served as lunch and dinner too. 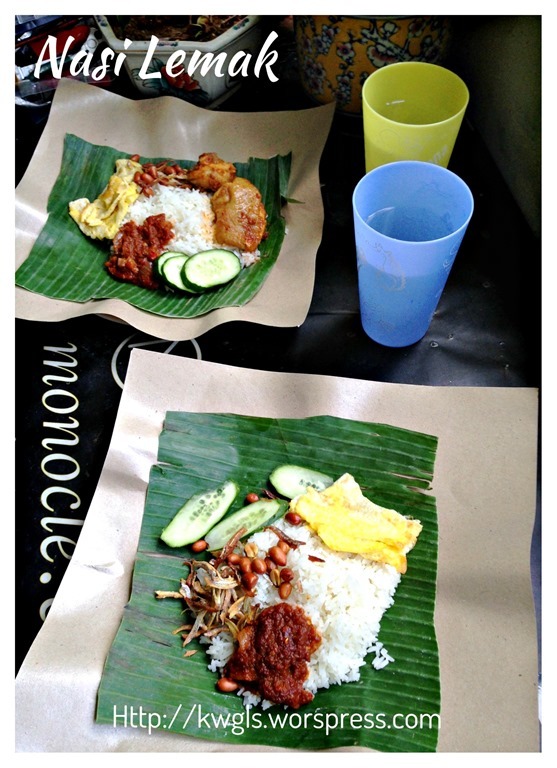 If you bought a package of commoner nasi lemak from a hawker store, it is very likely that they wrapped in a piece of grease proof paper. Some will have a piece of banana leaves.. 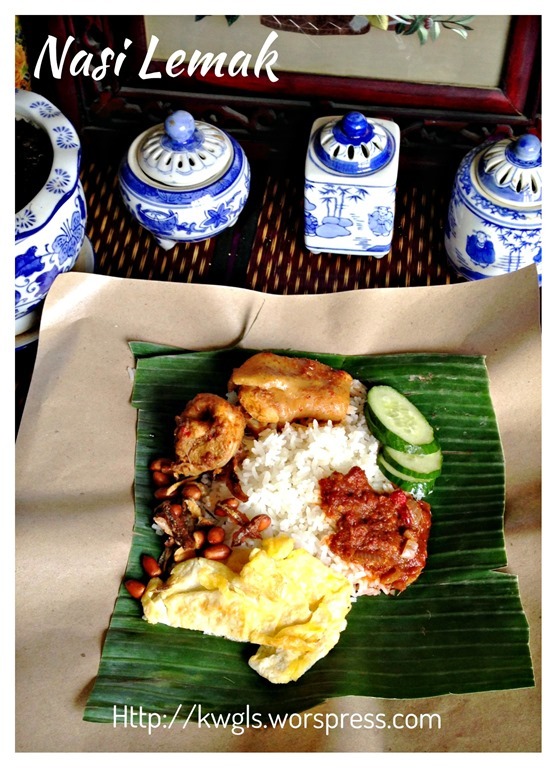 When you open the package, it is just some simple side ingredients and most will eye on the mouth watering sambal. 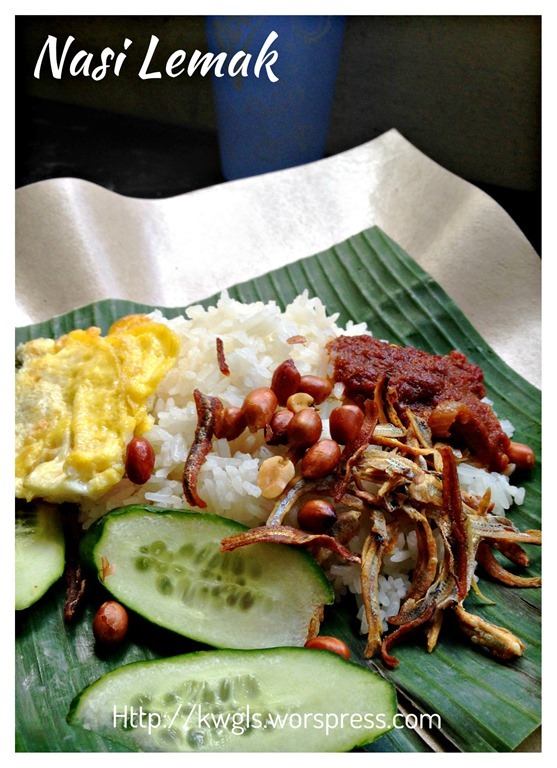 The rice shall not be soggy but grainy, fragrant and full of coconut aroma..
What I am sharing today is the most basic type of Nasi Lemak, those that commonly sold in hawkers centre without any costly items such as chicken， prawns etc. 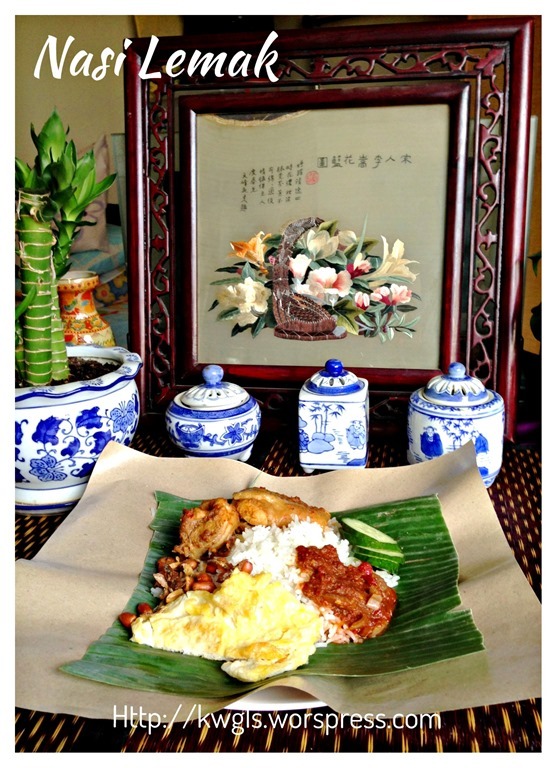 I therefore name it as Kampong style Nasi Lemak. 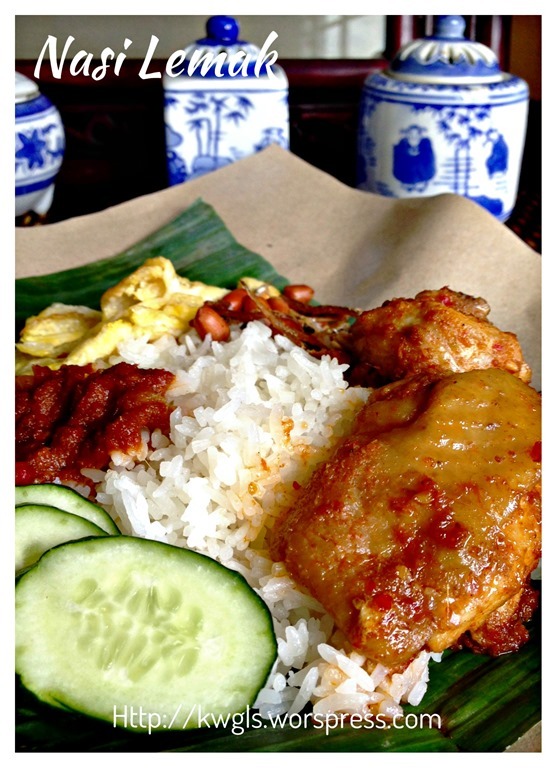 If you purchased a commoner’s package of nasi lemak at say SGD1.50, it is very likely that you will get some eggs (either hardboiled or pan fried), cucumber, sambal, small fish (either anchovies or ikan kuning) and some peanut. 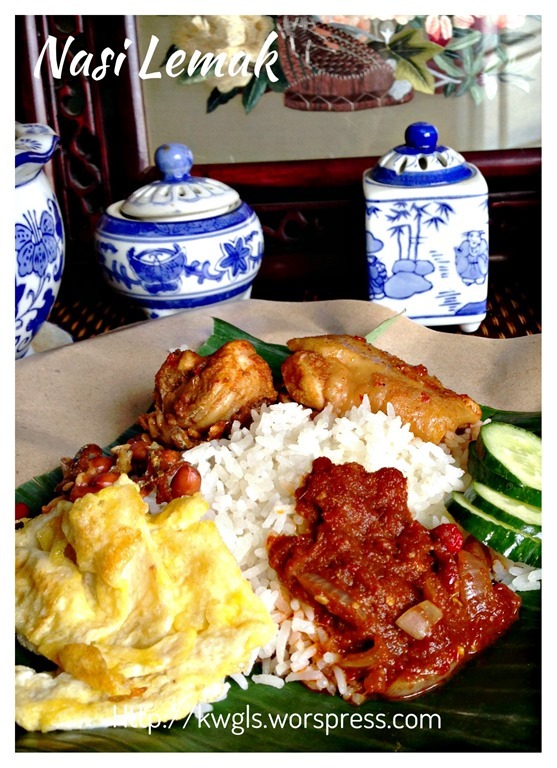 I will not share the recipes of all the side items for the nasi lemak but only a few basic recipe such as the rice, sambal and ikan bilis. Many of the side items can be easily bought over the counter. 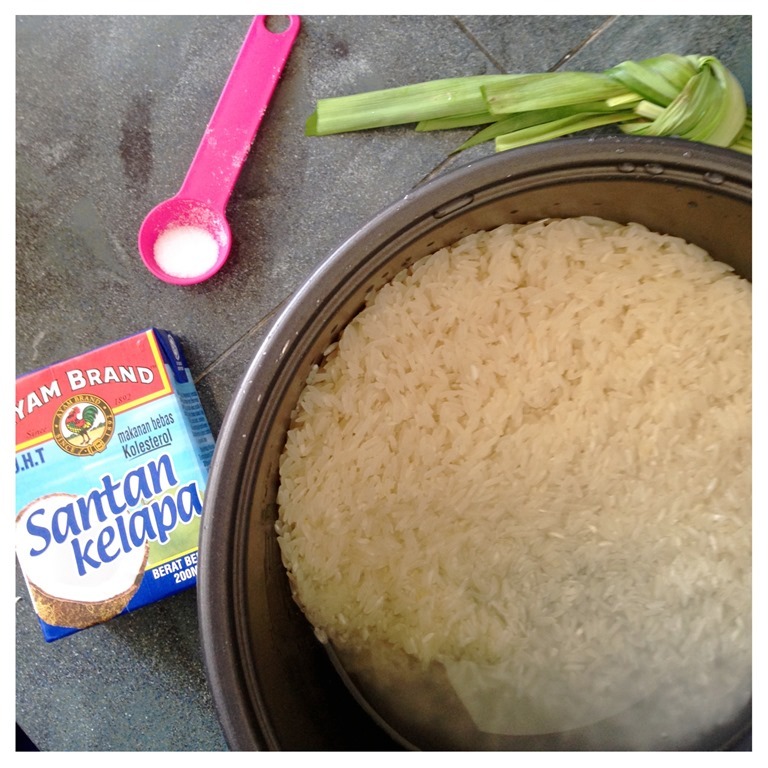 Wash the rice, drained, transfer to rice cooker, add the salt and pandan leaves. Since this is two cups of rice, in general, you will need 2 cups of liquid. Therefore, measure the coconut milk using the rice cooker cup and top up the difference with plain water until 2 cups of liquid (water plus coconut milk). 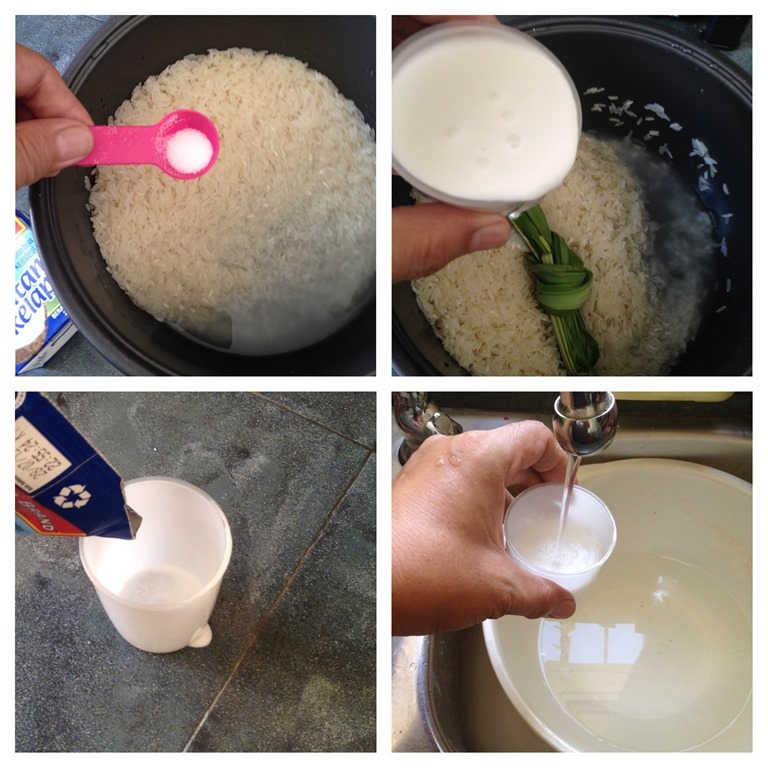 Alternatively, you can just measure the 300 ml of water and 200 ml of coconut milk to cook the rice. For the coconut milk, a bit more or less is acceptable and depends very much on your taste buds. 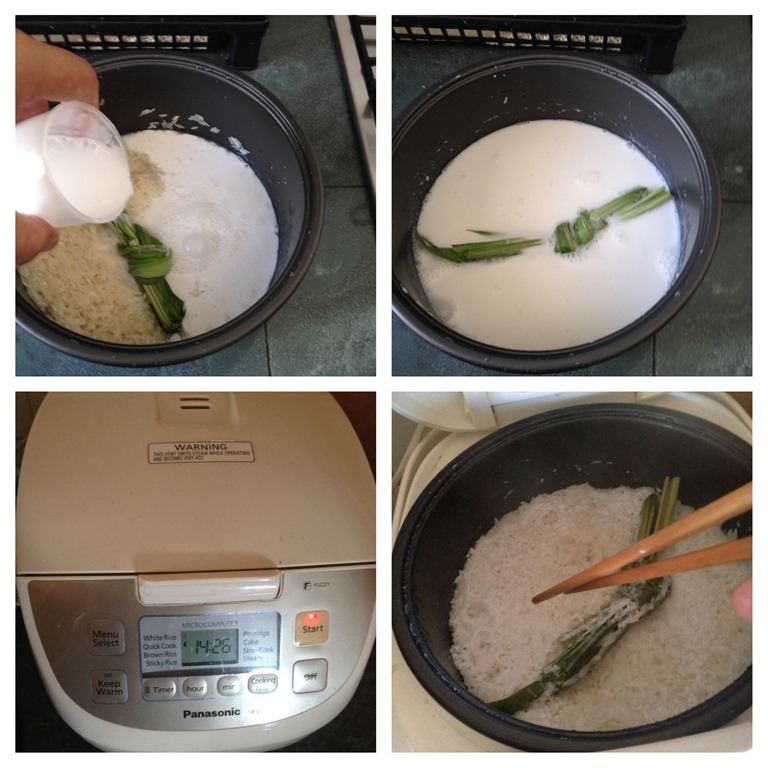 Cook in the rice cooker per the rice cooker instruction. Once done, fluff the rice with some chopsticks . 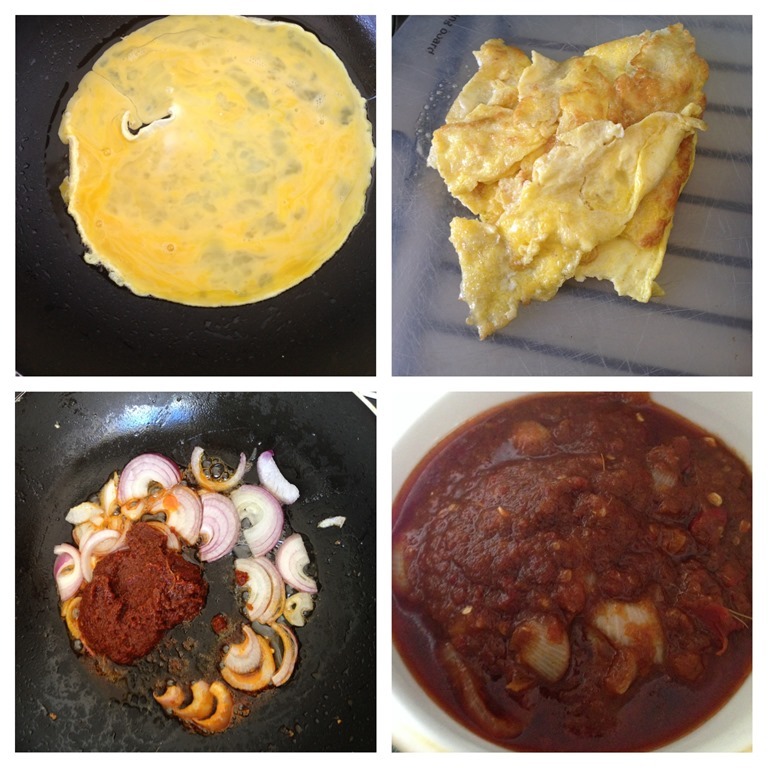 Beat the eggs and in a frying pan with some oil, fried the eggs until it is a thin omelette. Cut into pieces of desired size. Set aside for later assembly. Alternatively, you can have some hard boiled eggs or fried the whole eggs as instead of omelette form. for the detail list of ingredients and basic chilli sambal preparation. Heat a work with some oil, saute the onion until fragarant. Add 5-10 spoons of basic chilli sambal, stir fry until well mix. Add the ikan billis, and sugar, stir fry for another 2-3 minutes before dish up for serving. 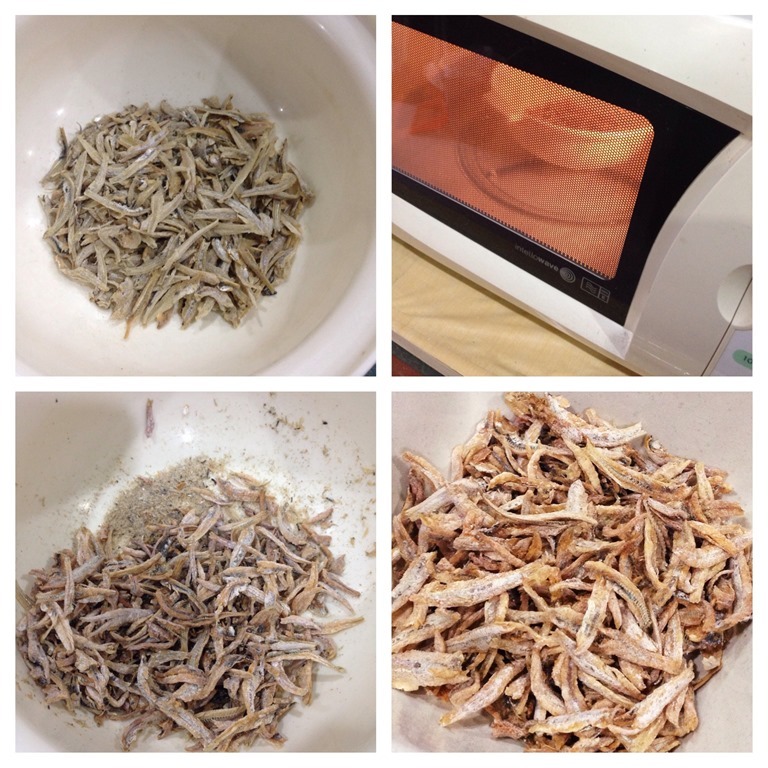 For the anchovies, put the cleaned anchovies in a microwavable bowl. Add some salt and white pepper. Cook in the microwave oven for about 2-3 minutes or until crispy. Set aside for later assembly. 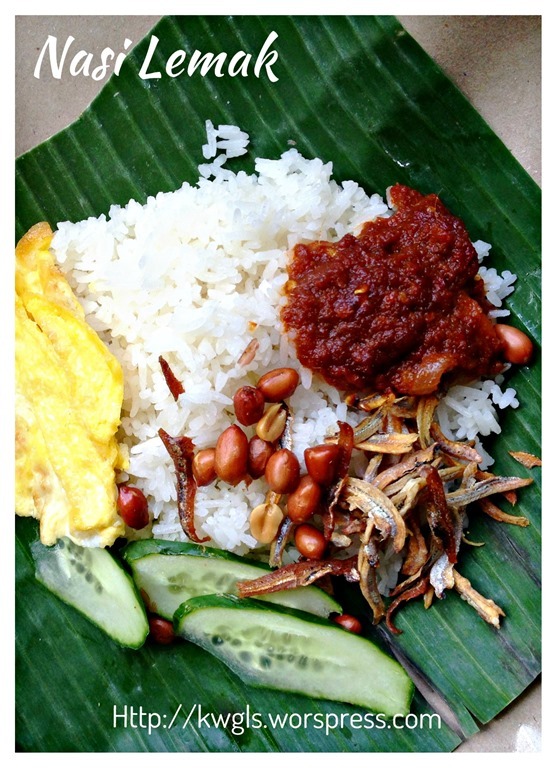 For assembly, have a plate of coconut flavour rice, put a piece of egg omelette, some peanuts, anchovies and a scoop of chilli sambal on top of a piece of cut cucumber. 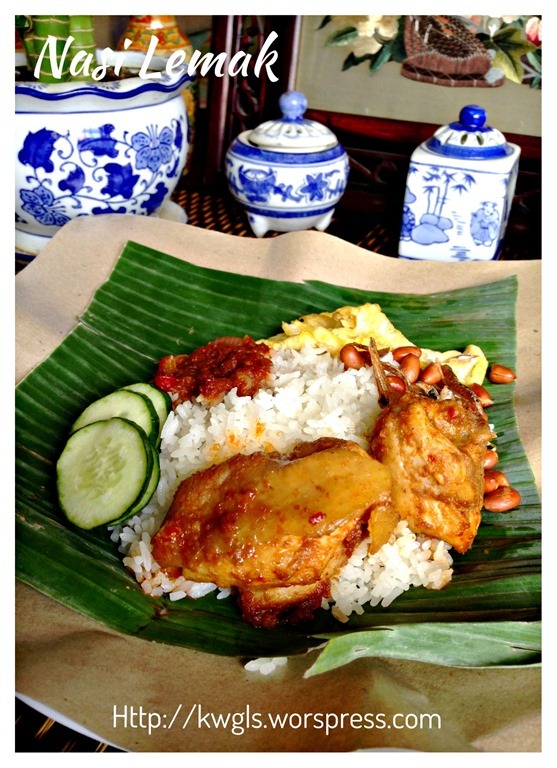 Best served when the rice is piping hot and can have additional side dishes like curry chicken and sambal prawns. This is a post that nothing to shout about. It is very basic and common. For the rice, you will have to exercise some judgement over the liquid used by following your rice package instruction. It should not be grainy and not too wet. A bit more or less of coconut milk is acceptable. The side dishes variants are many. Feel free to change to the type that you always have and most of which can be purchased over the counter. 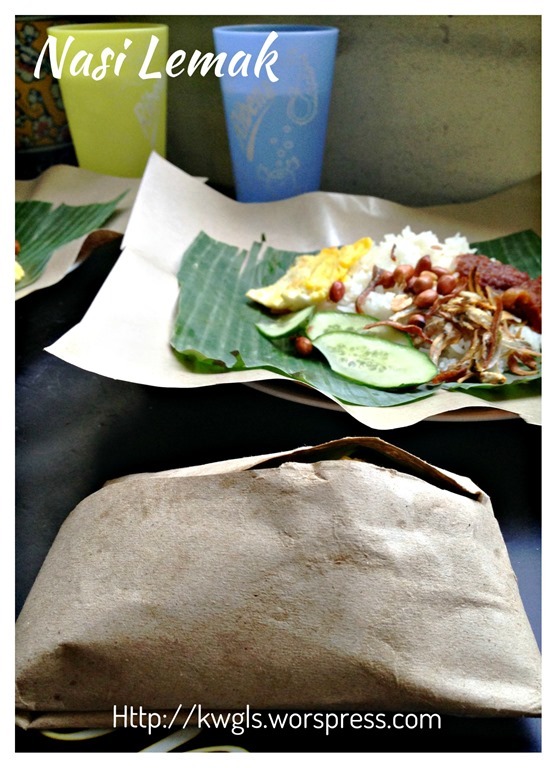 Possibly you would like to have some Otak. 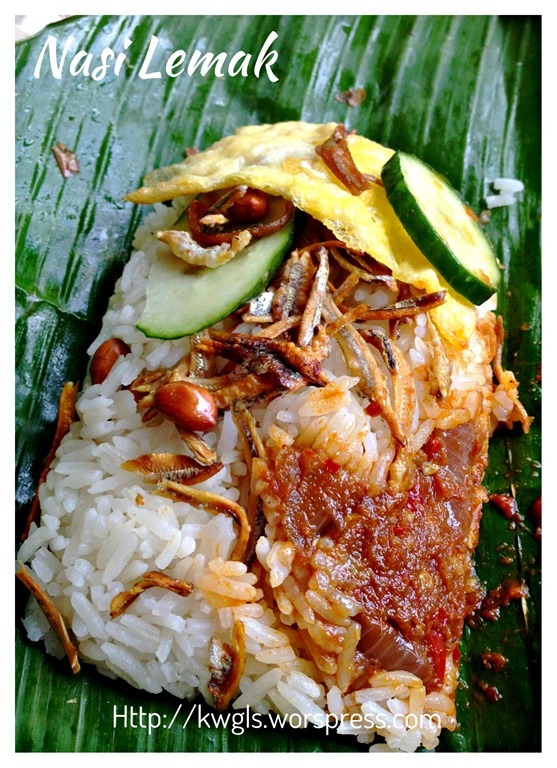 As for the sambal, remember to refer to this post Basic Sambal Chilli Preparation and add some onion, ikan billis and sugar to transform it to the nasi lemak sambal chilli. Hope that you like the post today. Cheers and have a nice day. 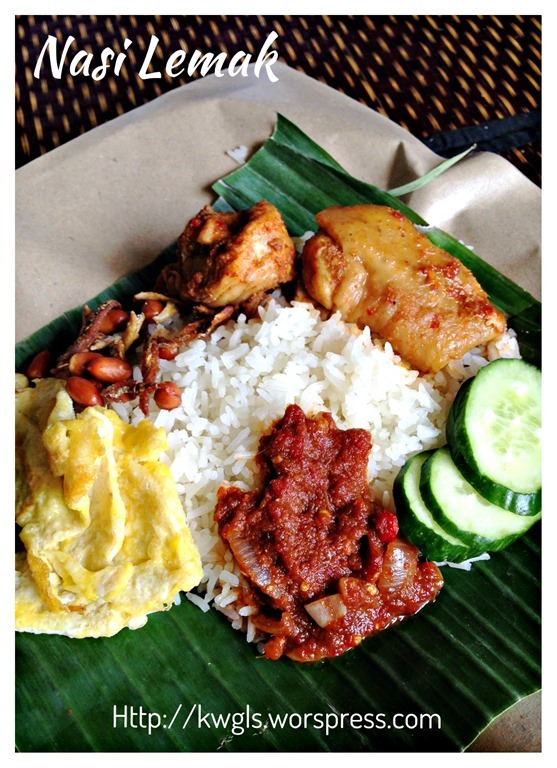 This entry was posted in Dish, Food Preparation Series, Noodles, Rice and Others and tagged 8, coconut flavoured rice, coconut rice, GUAI SHU SHU, Guaishushu, kenneth goh, Nasi Lemak, postaday, 椰浆饭. Bookmark the permalink. My rice turns out to be light brown, not white like yours. Anything i did wrongly? hmmmm, unsure why light brown.. Never encountered and very unlightly since rice is white, santan is white unless your rice is burnt. Can i omit the pandan leaves? What can i use to replace pandan leave? Im currently in taiwan and i cant get pandan leave here.